Discover just how much more flexible your Epson projector could be with our projector solutions. Take advantage of Epson’s specialist software solutions to enrich your projector and benefit from increased capabilities, confidence and control. As the world’s leading projector manufacturer3, we understand the need for the right projection solutions – allowing you to present the way you want, where you want, easily and effectively. At Epson, we realise inspiring presentations and innovative solutions go hand-in-hand – which is why we have developed a dynamic portfolio of advanced projector tools. Whether you’re managing multiple projectors, or want to be more dynamic in the way you work, these solutions will optimise your business productivity, and give you a platform to deliver your best work and ideas. Free up presentations by controlling your projector from a smart device. Simply present documents and make direct annotations with our easy to use iProjection app. It’s available for iOS and Android smart devices. Epson iProjection for Chromebook is an intuitive mobile projection app that enables wireless projection from a Chromebook to an Epson projector with network functionality. Screen mirror and share content effortlessly with Miracast or Intel® WiDi from compatible smartphones, tablets or PCs. Get quick and easy access to the LAN, without the inconvenience of untidy wires or cables, by using our high-speed, wireless network adapter. Set-up in seconds with our quick wireless USB key that provides ad-hoc, cable-free connectivity, with no reconfiguration required (PC only). Easily send content from your computer to the projector via a wired or wireless network. Sharing content in this way allows you to project data from different computers, without the hassle of changing the input cable. Collaborate on presentations by connecting up to 50 PCs or smart devices to one projector via a wired or wireless network. You can also select up to four connected devices and send their screens to the projector. Maximise your time by staying in control remotely. You can check the status of all the projectors from one computer by connecting multiple Epson devices to a network. Bring presentations to life by using our interactive pen to navigate, annotate, select, scroll, draw on, save, and interact with projected content from your computer via the interactive or whiteboard mode. Convert your PowerPoint presentations to fit on a USB storage device, to project directly without the need for a computer. Enable everyone to see clearly by using the Throw Distance Calculator, to work out the right image size and projection distance. Supports cloud storage services such as Dropbox. Use with an interactive projector for best results. Survey conducted by Future Source Consulting Limited for the period from 2001 to 2015. Be free to interact with your audience, deliver a more dynamic proposal, and engage them to gather ideas. Our iProjection app enables this by allowing you to wirelessly present documents, images and web pages directly from your iOS or Android smart device. This built-in annotation feature allows you to use a digital pen, highlighter or eraser, with colour and opacity options, to mark up and write notes over the projected image in real-time. Download the iProjection App from Google Play or the App Store, connect your smart device to the same network as the projector, and then launch the iProjection app. Easily add exciting content to your presentations, by wirelessly streaming it to your projector from smartphones, tablets and PCs (that support Miracast or Intel WiDi). It's designed and built on Wi-Fi Direct - a technology that enables two devices to form a direct, peer-to-peer Wi-Fi connection to screen mirror. It allows you to display content such as photos and videos from your device without cables or a network connection. The high-speed, wireless network adaptor allows you to connect to selected Epson projectors, allowing quick and easy access to the LAN or peer-to-peer networks, without wires or cables. When used with Epson Epson Projector Management and Network Projection software, you can remotely access and control projectors over the wireless LAN. It provides fast, ad-hoc, wireless connectivity (PC only). There is no need to connect over a network. Simply plug into your PC and in a matter of seconds, the key will download the information necessary for setup – no reconfiguration is required and it's simple to use. Enjoy the flexibility of displaying content on any network-enabled projector, via any existing wired or wireless local area network infrastructure. You can display content on multiple projectors from one computer, and enjoy the freedom of showing your presentation from multiple sources without switching the input source. Simply install the software on your desktop or laptop PC and, whether you have two users or fifty, you can share content with everyone’s computer via a local area network. Select up to four devices via the moderator function to project their content simultaneously for everyone’s benefit. Epson iProjection App for Chromebooks makes it easy to move about the room and effortlessly share content with the entire class by wirelessly sharing Chromebooks with the classroom projector. The Epson iProjection App for Chromebooks can display content from a single Chromebook on an Epson projector. When used with the Epson Multi-PC Projection with Moderator function, teachers can select and display content from up to four Chromebooks at one time. 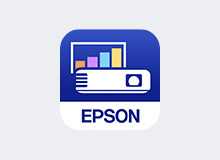 Download the Epson iProjection app from the Chrome Web Store. Before you set up the Epson iProjection app, make sure that both your Chromebook and Epson projector are connected to the same network. See your projector documentation for more information on connecting your product to a network. This handy tool allows IT, facilities and network managers to efficiently monitor and control multiple projectors at once, checking their status and controlling the projectors from a single source. Remotely power projectors on and off, switch input sources, and more. Get organised with message broadcasting; a plug-in for Epson Projector Management. Administrators can use the plug-in to send messages or announcements in JPEG formats to one, several, or all the projectors on the network. The message can be sent manually, or set to distribute at a specific time. Make your presentations more engaging by annotating the screen in real-time using either an interactive pen or your fingertips. The content annotation and whiteboard feature helps to keep your audience's attention, and whatever you do on screen can be pre-prepared, saving lengthy note taking. Leave your laptop behind - our EasyMP™ Slide Converter enables you to put PowerPoint presentations onto a USB storage device from your computer, by converting them into two file types (with or without animations). It's simple - just insert the loaded USB storage device into the projector’s USB port and present. Using our Throw Distance Calculator, you can easily work out image sizes and projection distance dimensions across our entire projector range. Simply select your desired screen size or the projection distance, and the smart online tool will automatically calculate all of the necessary installation dimensions. We've successfully received your newsletter registration request.